What I done is a bit of optimization of his alpha applying method and now it is about twice more faster. But the major reason to create my version was the need of custom background color option, since that method is based on color comparison and the color affect the final alpha separation result. Also a custom background color has other benefit more tactile when we has transparent objects. spend some time as well to make the script runing in old Max's. but they do not limit the functionality of the script. Only hidding the World Axis goes via DialogMonitorOPS (Max2008+) but it slow down the process anyway and I include it just because am sure someone will ask it. You'll save a time if you turn off the World Axis once by hand and keep it hidden until done your shots. Default save path (in case you not set any) is Max/previews folder. All UI settings are stored in ini file for use in the next runs. but for the aim of this script, it is fully enough. 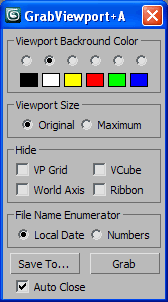 Maximum Viewport Size means Maximize + Expert mode. Auto Close is for the dialog. your image file name would be "2011-6-17-12-32-47.tga"
I presume you may like it (if not - use Numbers). and use it mostly when I send my jobs to Backburner. Included VBScript (GetCurrentDate.vbs) just log Date-Time to file. It is called only in Max versions below 9 and without AVG extensions. this is a subject interesting to coders only. Maybe a few minor changes are possible but the main method not hide improvement points. There is another method that looks more promising and I'll research it when I can. Submitted by Script_Butler on Wed, 2011-06-22 01:40. Good question. I thought i read on here that it wasn't supported in 2010 but it's not there anymore! I think the other reason was i couldn't find it after running the .mzp. I found it under the tools menu tucked away! Submitted by Anubis on Tue, 2011-06-21 11:21. Why you think it's not supported in 2010? Submitted by Script_Butler on Tue, 2011-06-21 02:23. Whats the reason it's not supported in 2010? Submitted by Anubis on Sat, 2011-06-18 17:18. Submitted by ravenslayer on Sat, 2011-06-18 13:58. I see you optimized some stuff so i hope you don't mind me looking into your code. great work and thanks for sharing this!